"Were you there when they nailed Him to the cross?" Or, maybe you caught the dramatic re-enactment recently playing at a theater near you. After its release on Ash Wednesday, Mel Gibson's blockbuster epic, "The Passion of the Christ" became one of the highest grossing movies of all time. While moviegoers may have found it difficult to swallow their popcorn (the content is graphically violent), the film generated a media feeding frenzy, both pre and post release. Newsweek ran a cover story (February 16) "Who Really Killed Jesus?" and, not to be out done, TIME followed with "Why Did Jesus Have to Die?" (April 12) Dateline NBC aired a one hour special "The Last Days of Jesus" in February, and re-broadcast it during Holy Week. PBS re-broadcast all four hours of "From Jesus to Christ" on Easter Sunday and NPR aired numerous thoughtful interviews with prominent theologians and scholars. The latest novel in the Christian literature "Left Behind" series, "The Glorious Appearing", began appearing in bookstores in March and quickly rose to the top spot on the New York Times bestseller list. CBS News explored the phenomenal success of these books in a Sixty Minutes II segment, "The Greatest Story Ever Sold" (April 14). Not at any time in recent history had the annual arrival of Easter been accompanied by such a powerful chorus of voices. There was no shortage of controversy, commentary and analysis by journalists, bible scholars, historians, true believers and just regular folks on call-in radio shows. Christian theology was front and center in the public arena and with overlapping Passover and Easter celebrations, perhaps it is relevant in 2004 to paraphrase the question Jews have been asking at the Seder table for thousands of years—not “Why is this night different from all other nights”, but "Why is this year different from all others?" As one might guess, the timing is anything but coincidental, and much of the heightened visibility owes more to the stars in heaven than in Hollywood. A glimpse of the stellar map reveals that this year is an important Holy Week anniversary. Two star gazing Romanian astronomers, using biblical references and historical astronomical data, recently calculated accurate dates and times for both the crucifixion and resurrection of Christ. Accordingly, the former occurred on Friday, April 3rd 33 AD at 3 PM and the latter on Sunday, April 5th at 4 AM. Astrological charts, cast for these events, illustrate a striking correlation between certain key planetary positions at that time and again in the present. No less than three outer planets--Pluto, Neptune and Saturn--those that speak to our collective destiny-- are residing in the same signs today as they were in 33 AD. This energetic imprint is powerful and rare, occurring only once in five hundred years. By this yardstick we are celebrating its fourth "anniversary", and its first occurrence in the New Age of Aquarius. Both factors are significant. We are resurrecting some very old themes, and society at large is feeling the impact. On the planetary front, the star players are Pluto in Sagittarius, Neptune in Aquarius and Saturn in Cancer. The combination is a volatile one-- fertile ground for a revolution in religious ideology. The positioning of these planets in these signs rarely coincides because of the time frame involved. Pluto takes 248 years to orbit the sun and transits each zodiacal constellation for 15 to 20 years; Neptune takes 165 years to make a complete revolution and occupies a given sign for about 13 years. Saturn, the fastest, makes a round in only 30 years, staying in sign for two to three years. When one of these planetary cycles repeats (i.e. the planet returns to a given sign) it resurrects the issues from the previous cycle while raising them to the next level of understanding as we move forward in history. So, every 248 years since the death of Jesus, Pluto in Sagittarius has raised the stakes, so to speak, on religious philosophy. And every 165 years, Neptune in Aquarius has challenged the popular imagination about the true nature of God and His/Her relationship to man/woman. These are wide footprints--but following these tracks leads to some of the most significant events in the history of Christianity. For example, the planets were in these appointed places on October 31st, 1517 when Martin Luther nailed his Ninety-Five Theses to the church door in Wittenberg and ignited the Protestant Reformation. Several important parallels exist between the time of Jesus and the present day, not the least of which is that both epochs stand at a crossroads between two Precessional Ages. The beginnings and endings of the Great Ages (each approximately 2000 years in duration) do not have clear lines of demarcation and, due to major energetic shifts, the transitional periods are historically times of upheaval. They are marked by the erosion of cultural institutions, by the gradual emergence of new forms and by defining events which catalyze change. These often cataclysmic events need to be recognized for both their apparent and symbolic impact. They set into motion complex chains of events, the various threads of which will eventually be woven into a new tapestry. 911, occurring as it did at the "dawning of the Age of Aquarius" is such a cataclysm. An astrological chart, constructed for the impact of the first plane, is ripe with prescient symbolism. Looking back over the last two millennia we could easily make the case that the death of Jesus was the catalyst that jump-started the Age of Pisces. In many ways, the crucifixion is a metaphor for the intersection of the energy of the outgoing Age of Aries (2000 BC - 1 AD) with the emerging paradigm of the Age of Pisces (1 AD to 2000 AD). The stark brutality of the former is sharply contrasted with the message of the latter-- love, forgiveness and compassion. We are currently exiting the Age of Pisces--the last 2000 year Age for which Jesus is the acknowledged avatar. The Piscean Age was dominated by the establishment, growth and expansion of institutionalized Christianity and its subsequent influence in re-shaping global geography and politics. As we progressively enter the Age of Aquarius, we will be witnessing the death of old ideologies and the birth of new perspectives. It is particularly germane that Piscean (read "Christian") religious themes are being resurrected at this critical transitional juncture; they are providing an important opportunity for raising public consciousness. The context of religious discourse, while currently focused on Christian content, is actually much broader, encompassing the whole evolution of spirituality on the planet. Obviously, this topic is far too ambitious for this inquiry, but deserving of mention. Coming full circle -- hopefully, understanding these macro-cycles sheds light on the timely and "thematically correct" release of "The Passion". The medium (in this instance the Piscean medium of film) is a true messenger. Interestingly enough, a major criticism of Gibson's film is that it pays too little attention to the Resurrection, while promoting a narrow theological doctrine that reflects the biases of the filmmaker. Gibson's ideology is obviously shared by many Christian fundamentalists, accounting for much of the big bang at the box office. Regardless, in the larger perspective, the film is clearly a "meant to happen now" vehicle for raising awareness, erasing apathy and plunging the American public into a hot debate on the meaning of religion, morality and spirituality in our lives. Mercury’s retrograde station on the first day of Passover is a contributing factor. Information hitherto deemed un-newsworthy made its way into the mainstream media. As a result, the scope and influence of Evangelicals in America is becoming more widely understood. Who knew that they comprise 46 percent of the population? We are currently re-visiting many issues with ancient origins such as the literal versus metaphorical interpretation of scripture, our relationship to God and the proper place of religion in politics, government and society. Yet another parallel between our world today and Jesus' time is the predominance of apocalyptic vision (the sequel to "Passion" could be "Apocalypse, Then and Now"). Just as Jesus was a religious radical of his day, many contemporary challenges to religious authority and ideology currently exist. The Catholic Church, for example, is under tremendous pressure to reform. Then, as now, we see how the volatile combination of religion and politics can lead to flawed decisions. Solutions created in the Age of Aquarius however, must have a different vision, agenda and impact than those born under Pisces. It is time to update the message. Martyrdom, out—personal responsibility in. 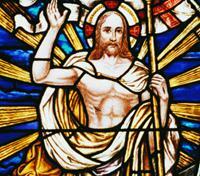 Even Jesus counseled followers to discover the "Christ-Consciousness" within. Saturn won't change sign for about another year, so we can expect a more tense than usual Christmas season for American families. “Front page” coverage of religious issues will no doubt continue, at least through next Easter. Pluto (transformation) stays put in Sagittarius (religion) ‘til 2008 and Neptune (spirituality) will be in Aquarius until the end of 2011. (There is still time to repent before the prophesied end of the world in 2012!) What is ahead for religion, or spirituality, per se, in the "New Age"? What will we bring forward of value from the past? What do we need to leave behind? What will we create in the future? America is currently facing some immense challenges. At stake are the constitutional separation of church and state, the integrity of marriage and the teaching of science in our schools, to name a few. We are under siege from radical Islamic religious fanatics, have launched a new crusade in the Middle East and religious ideologues here at home are at war with our democracy. "Sometimes it causes me to tremble". Judith Goldberg, MFA, holds a Master’s Degree in Art Education from the Maryland Institute College of Art and a Certificate in Karmic Astrology from Creative Choices, Inc., (www.creativechoices.com) where she studied under Linda Brady, author of Discovering Your Soul Mission. Judith writes a monthly astrology column in Spirit Crossing. She has a private practice as a Vocational Astrologer in Baltimore, Maryland. Judith welcomes your comments and questions. She can be reached at judith.goldberg@verizon.net. © 2004 Judith Goldberg. May be reproduced only in full with written permission.